Caterpickles Central is still buzzing from the events of last Tuesday. Thanks to a dear friend, The Eight-Year-Old and several of her friends (including her Mommyo!) 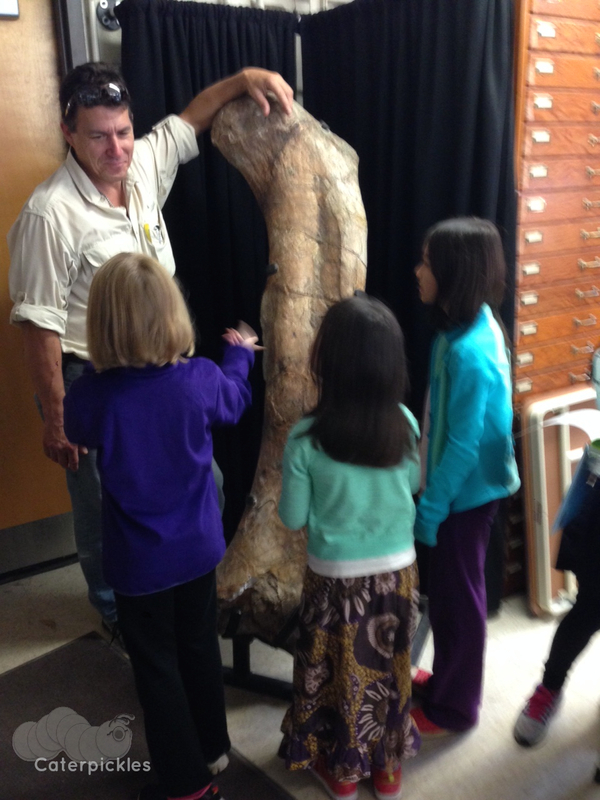 got to meet world-famous paleontologist, Dr. Paul Sereno. Elementary school kids everywhere will know exactly whom I’m talking about. Crack open any recent dinosaur book (or watch a few episodes of Dinosaur Train) and you’re sure to encounter a few of the dinosaurs Dr. Sereno and his team have discovered, such as Eoraptor, Jobaria, Suchomimus, or Nigersaurus. Your taste run to giant crocodiles who thought dinosaurs were simply a tasty snack? Dr. Sereno has described a few of those as well, including Sarcosuchus, a 40-foot-long predator nicknamed SuperCroc, who currently holds the title of the world’s largest crocodile. There’s also Kaprosuchus, the BoarCroc, a 20-foot long, triple-fanged and horned crocodile for whom dinosaurs were probably more like dinner than a snack. More of a flying reptile person? Perhaps you’ve read about the African Pterosaur, a flying reptile with a 16-foot wingspan which Dr. Sereno and his team discovered in the Southern Sahara in 2003. Walk into a paleontologist’s lab and you expect to see fossils. Lots of fossils. Dr. Sereno’s lab is no exception. Most of the Eoraptor bones I spotted were tucked away on shelves, but there are a host of Raptorex, SuperCroc, and T-Rex fossils lying about. 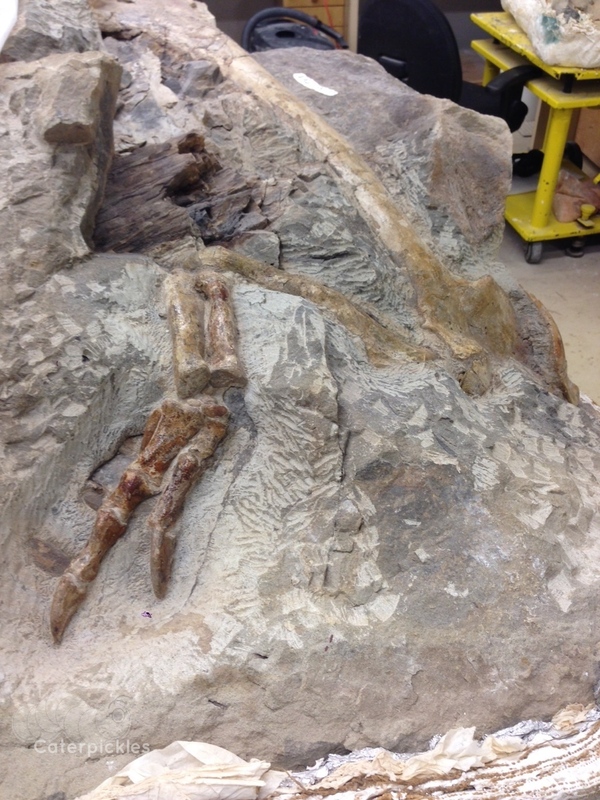 Some of the fossils have been fully excavated. 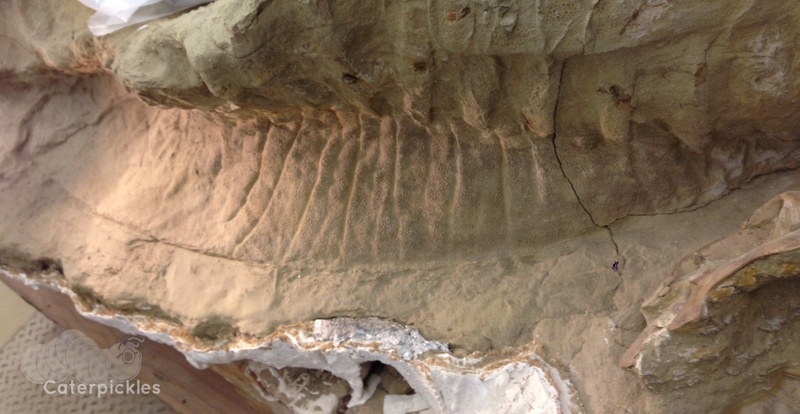 Some of them are obviously still in the works, like this remarkable 3-D T-Rex fossil which is still undergoing active analysis. 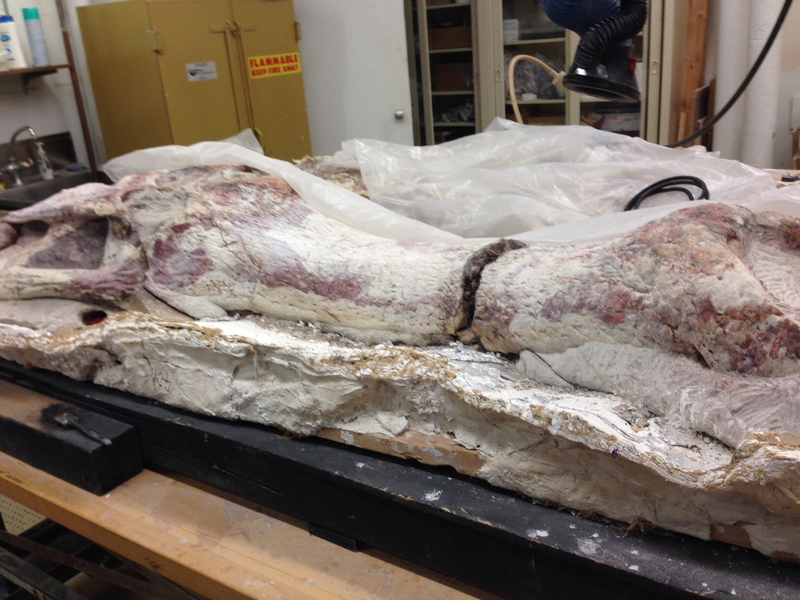 Dr. Sereno’s lab even includes a dinosaur mummy, complete with a long swatch of skin. Dr. Sereno was talking about the potential that swatch raised for resolving the long-standing dispute about whether dinosaurs sported scales or skin, but my mind was buzzing with another question entirely. But in case you weren’t paying attention when I posted that Classic Caterpickle last Tuesday, I’ll briefly sum up. In 2012, The (then) Five-Year-Old asked me whether dinosaurs had belly buttons. I told her I didn’t think so. I was pretty sure having a belly button required having an umbilical cord first. Since dinosaurs were hatched from eggs, and not born as live young, they wouldn’t have needed an umbilical cord. Sadly, however, The (then) Five-Year-Old had already learned through previous experience that Mommyo was not entirely to be trusted on matters of anatomy, so she demanded that my hypothesis be put to the test. Immediately. Fortunately, we were in the Boston Museum of Science at the time, so we trekked downstairs looking for some answers. I won’t reprise the entire search here, I’ll simply say that in the end The (then) Five-Year-Old declared that the question would never be resolved to her satisfaction until she had personally inspected a mummified dinosaur’s skin. 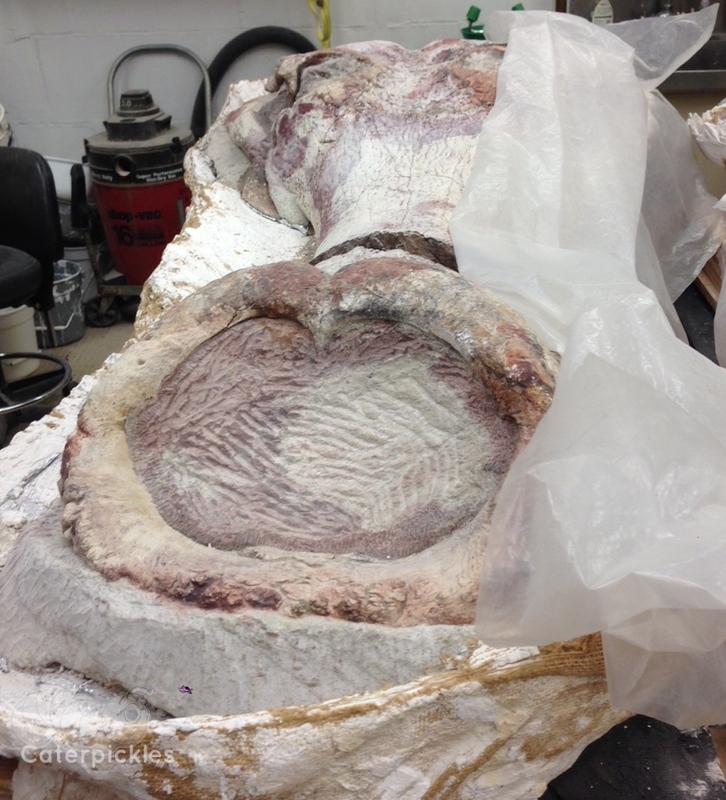 After three years, I was finally in a paleontology lab with both a world-famous paleontologist and a dinosaur mummy. What did you expect me to do? I took a good look at that exposed dinosaur skin. If I could find evidence of a belly button on my own, I could point it out to The (now) Eight-Year-Old and never need to even let Dr. Sereno know that I was looking for a belly button in the first place. Sadly for me, the skin was nice and ripply, but not in the belly button sort of way. Worse, not all of it was exposed. I’ve been answering The Eight-Year-Old’s questions for a long time. I know how her brain works. Just because the patch of skin I was looking at didn’t have a belly button didn’t mean that some other patch of skin still encased in rock wouldn’t have one. There was nothing for it. So after the inevitable expressions of embarrassment, I asked point-blank. That’s right. Put me in a room with a world-famous paleontologist and I will have him talking about belly buttons faster than you can say Suchomimus. In a testament to the effectiveness of what must have been hours and hours of absolutely grueling media training, the man managed not to laugh me out of his lab. He simply answered the question. Basically, belly buttons are a mammalian structure. They are the scar left when the umbilical cord that connected the fetus with the placenta during pregnancy detaches at birth. So what about the scar on baby bird bellies? Not a true belly button. The scar is the remnant of the baby bird’s connection to the yolk sac in its egg, but a true belly button requires a placenta, which creatures hatched via eggs never develop. Interestingly, while double-checking my memory this morning, I learned that human embryos are encased in a yolk sac during the very early stages of gestation. In our case, however, the fetus fully absorbs the yolk sac into its gut. The placenta then replaces the yolk sac as the source of the nutrition the developing baby needs for the duration of the pregnancy. So, is The Eight-Year-Old finally satisfied? That’s right. She never remembered asking the question at all. I could totally have let this one go.